How to choose a suitable solar controller? Your Position: > Knowledge >> solar controller >>> How to choose a suitable solar controller? Currently solar panels are divided into amorphous silicon Solar Cells and crystal silicon. Which can be divided into poly-Si and silicon. Material from the photoelectric conversion efficiency of three terms are: silicon (up to 17%)> poly (12 ~ 15%)> amorphous silicon (5%). However, crystalline silicon (silicon and polysilicon) is basically in low light will not have currents, amorphous silicon-based low-light good (in low light energy of the already small). Therefore, comprehensive view, it is appropriate to single crystal silicon or polycrystalline silicon for solar cell materials. In general, solar panels with solar power is proportional to chip area (the area of solar cell chip is not exactly the same area of solar panel package, as some solar While panels, but Solar Energy gap is very wide array chip, this is not necessarily high-power solar panels. such as the VSC-03 Although our solar panels is not, but the chip closely arranged, in the relatively small size also realized 0.75w power). In general, solar Panel Power is the better, so that large currents produced by the sun, can quickly be built-in battery is full. But in reality, the need for solar panels and solar Power Portable charger, find a balance. In general, we believe that Solar Power Charger can not be less than the minimum 0.75w, (the power of solar panels in standard light intensity under 140mA of current. Arising under the sun in the general current of 100mA or so) if less than the power charge current is too small, basically no significant effect. It is mainly responsible for two functions: First, to produce the current front-end storage to the built-in battery which as far as possible eliminate or reduce the waste to a minimum; second is when the charger for charging mobile phones and other devices, as many as possible will be within The battery in the power output to the mobile phone and other devices, but as little as possible power consumption will be online on the road. Unfortunately, due to cognitive or technical problems, domestic manufacturers of solar controller control circuit design optimization did not arouse enough attention, resulting in production out of less practical solar power charger: front-end can not store the current generated to the battery; built-in rechargeable battery for mobile phones and other devices when a large part of the current waste line the road, unable to enter the charging device. So consumers are choosing solar controller, you need to pay more attention to what these two indicators: Second conversion rate (front-end generated electricity stored in battery efficiency) and discharge efficiency (built-in battery in the electrical input to the need to charge the device efficiency). The two efficiency is better. In general, secondary storage efficiency can now do a very good 95%, discharge efficiency is 83% or more. 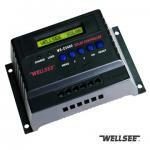 Produced by the standard solar controllers is designed for. As the solar controller with the ordinary use of the environment of electronic products are different, solar battery charger on the built-in demand is highest. But this is just easy to forget where the consumer is also a lack of social responsibility of the manufacturers of some easy tricks place. In the market, a similar capacity battery prices may differ several times, so some of the cottage manufacturers to aim at the piece of the profits, many very low-cost chargers are used in secondary batteries refurbished battery, good point is the use of battery products in the B, C batteries products. Such a short battery life is not that consumers are likely to risk the personal security. Solar battery charger built-in lithium polymer battery should be better, compared to normal most common lithium battery (lithium ion), lithium-ion polymer batteries fitted into the gel, the level of activity is much smaller than liquid lithium-ion battery will not explode. And for the application of solar controllers use of the environment, the best high temperature processing polymer battery to improve battery temperature limit. If the solar controller with DC adapter, DC adapter and more concerned about quality is necessary. After all, this relates to the product and personal safety. There is a type of charge controller called MPPT Solar ChargeController. A MPPT (Maximum Power Point Tracking) Solar Charge Controller is an advanced type of solar controller. They are designed to help Solar Panels charge one or more batteries at maximum efficiency, as well as protect the batteries from damage to ensure the longest possible service life. Wuhan Wellsee New Energy Industry Co.,Ltd is contributed to solar, wind and water power system (solar controller,solar inverter, wind turbine), welcome to contact!